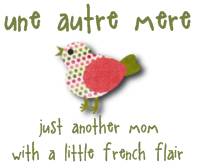 ~ just "another mom" with a little french flair! Adeline turned the ripe ol' age of 7 on September 3rd. I know - SE-VEN! I can't believe my firstborn has already reached an age that requires two syllables! But she was probably mostly excited about her "little" party. As you may recall, she had her first big "friend party" last year, and we had told her that this year it would be much smaller. Like just a few friends hanging out. No big deal. Really. By her request - a dolphin cookie cake. Complete with 2 kissing dolphins and a "Lego Addie" lounging on the beach with an ice cream shake under an umbrella. The lovely decorations. Okay, so I did make the banner, but all the dolphin masterpieces are completely her own. We decided whales would make a nice snack for a dolphin party. Another request - dolphin-shaped cookies. Fortunately she already had a "toy" dolphin cookie cutter. It wasn't the best, but it worked. You'll notice the lovely dolphin mosaics on the tables. Those were craft kits sent by Nana B. before her birthday so she could make them to use as decorations. The napkins and cups we already had, but I did splurge a tad and bought the plates when I ordered stuff for Millie's party from Oriental Trading. But they were still only $3 for 8, so I guess it wasn't that much of a splurge. The one other thing I bought was the party favors. The whale boxes were in the Dollar Spot at Target, the stuffed dolphins were from the Dollar Tree and the goldfish and M&Ms we already had. So, a total of $6 on party favors. And here are the guests! Little sis Millie (she was a freebie), cousin Clara, a friend from her 1st grade class and one from her 2nd grade class. A pretty good mix. And they all got along really well too, considering nobody really knew each other. After her friends left, we had dinner and then celebrated her birthday as a family. And no, I wasn't about to make yet another cake, so we just cut some pieces from her party cake. She was pretty excited about her Lego Friends sets. Since their birthdays, these girls have been building with their new legos like crazy! So now that makes 3 birthdays and 2 parties down. 1 party (our big, combined family one) left to go. Those pics to come soon! Addy is taking after her mother in the party planning department! Looks like so much fun. We love lego friends too. I think Olivia is going to be getting some for her birthday in a couple of weeks. God is Good. All the Time. I'm "just another mom" who loves staying home with my silly kids and who strives to follow Christ. Just like any other mom, my days have their ups and downs, but with 2 little girls in the house and a brand new baby boy, there's bound to be some drama! dolphins and unicorns and football, oh my!